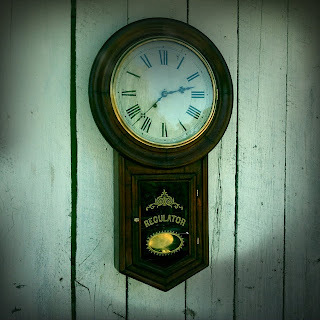 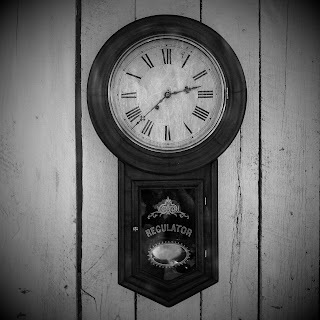 Judging by the overall style of the clock I dated it to be from around 1885. 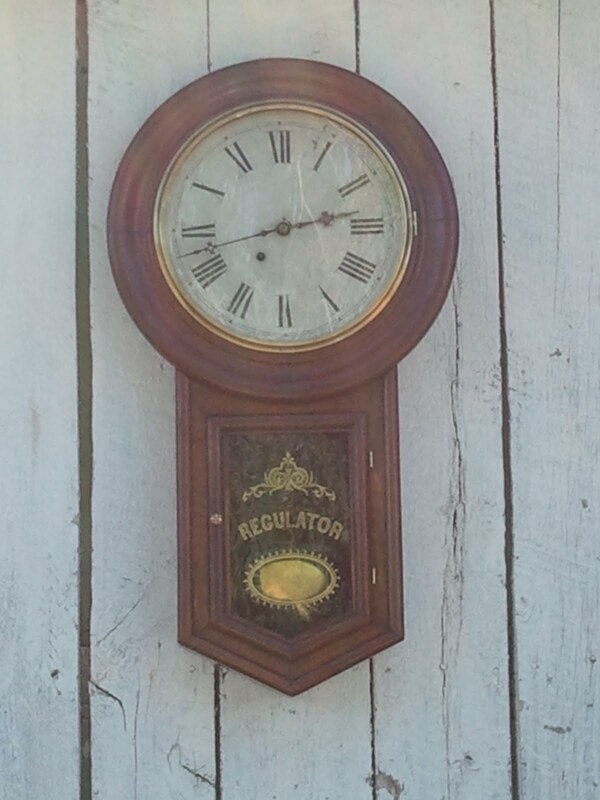 The clock has a Pine case with a Walnut turned frame surrounding the clock face. 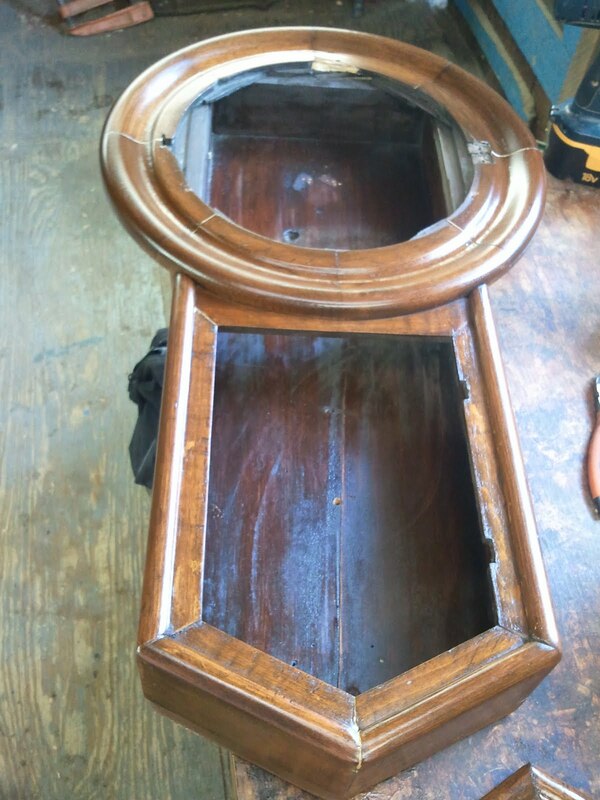 The Pine portions of the clock had been stained to match the natural color of the Walnut frame.It was evident that the clock had been refinished at some point in the past, and that the existing finish on the clock could be restored. 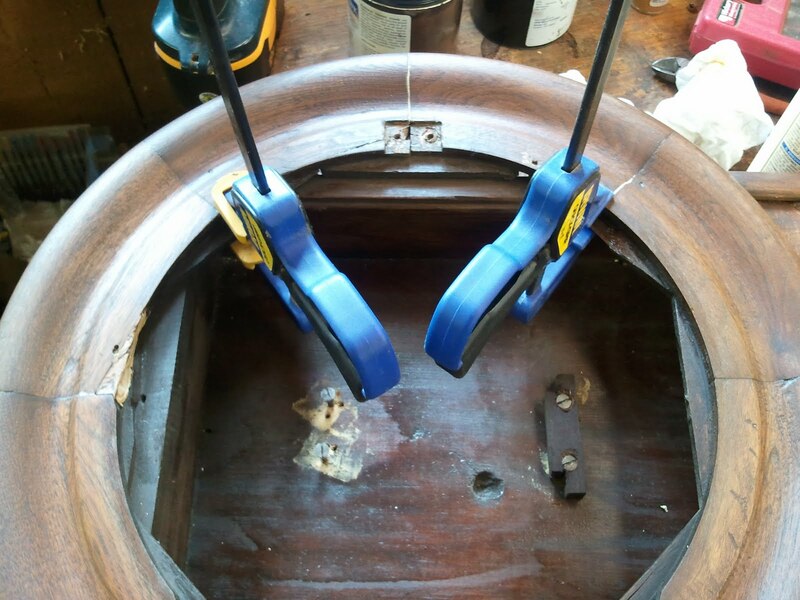 the following photos show the restoration of the finish as well as the repairs made to the clock. 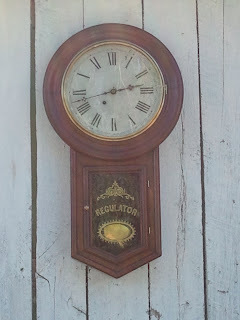 Here is a photo of the clock as it came to me. 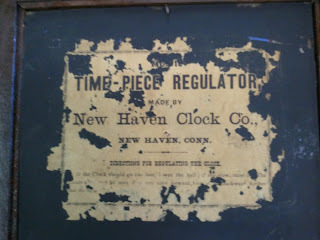 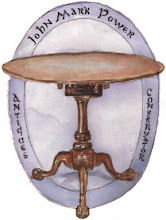 On the inside of the lower door which houses the pendulum, I found this label on the reverse side of the glass. To work on the case of the clock, I needed to remove the face of the clock as well as the works. 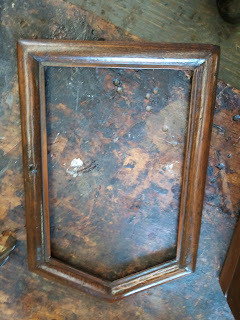 This gave me the opportunity to take a photo of the works which were in very good condition. 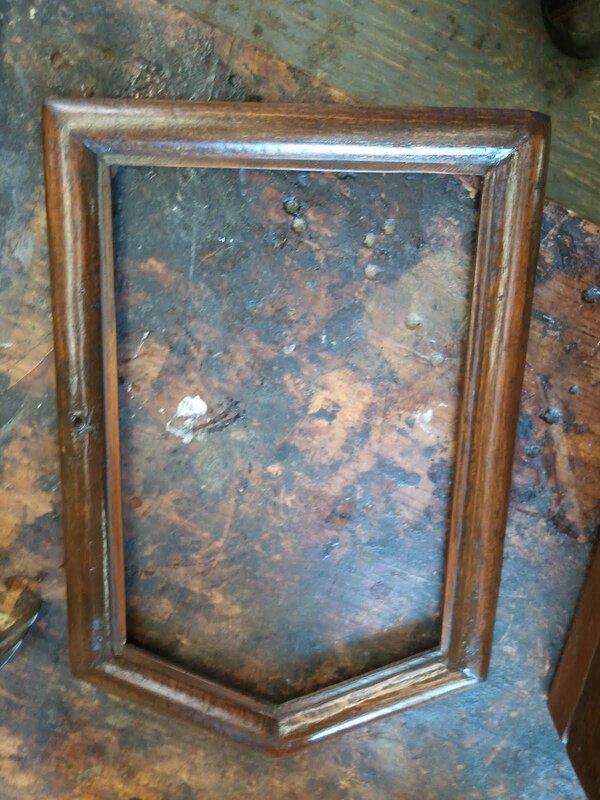 Most of the repairs were made to the turned Walnut frame. 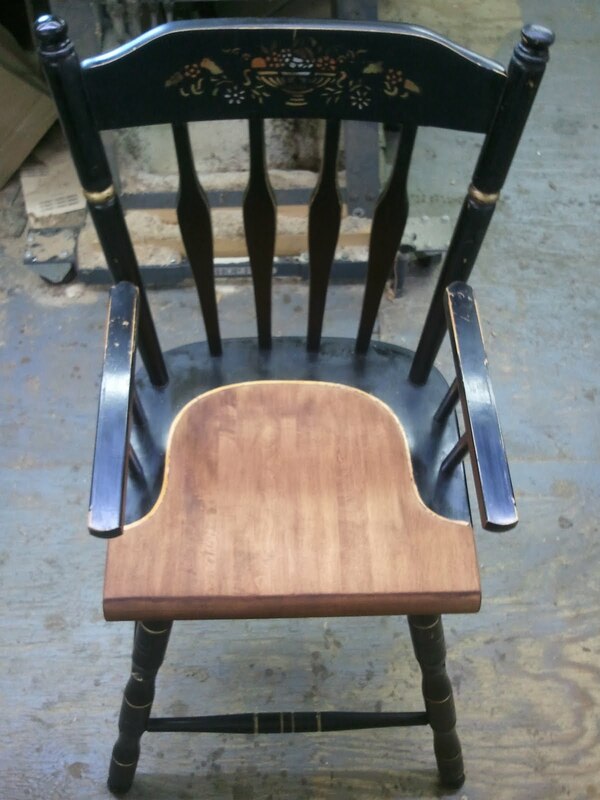 this was made up out of six individual pieces of Walnut which were assembled using several lap joints. 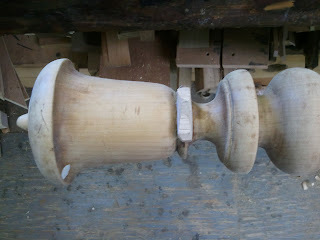 Once the pieces were fit together, they were turned on a lathe together to produce the molded frame. 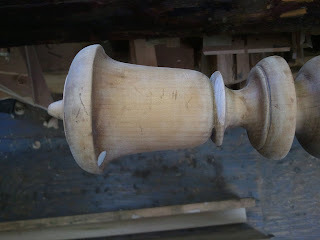 Several of these lap joints had become unglued over time and were loose. 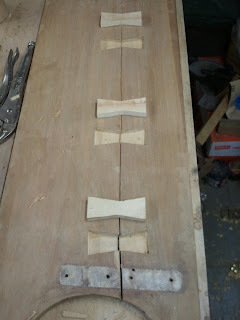 The photos below show the joinery being glued on the frame. After the repairs were made, the case was cleaned and new finish was applied to the old, bringing out the natural beauty of the wood. 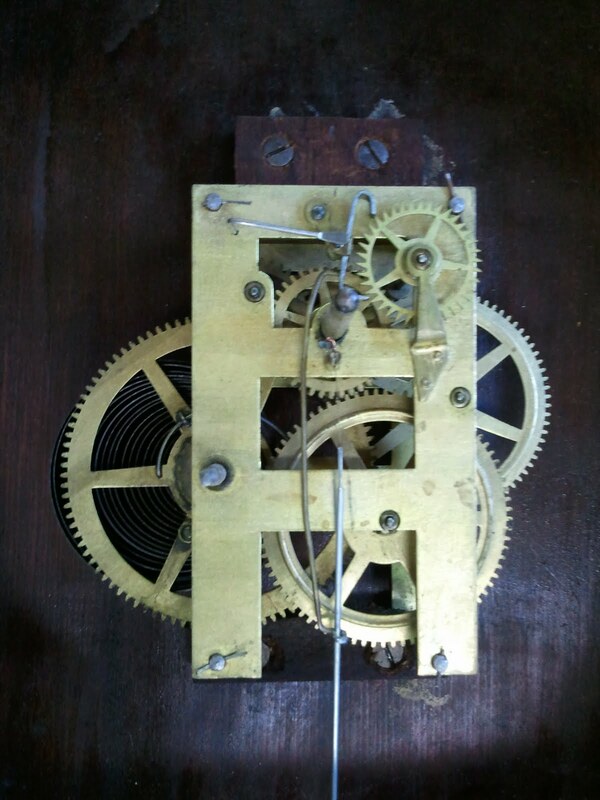 Meanwhile, all of the brass parts (excluding the movement) were cleaned. 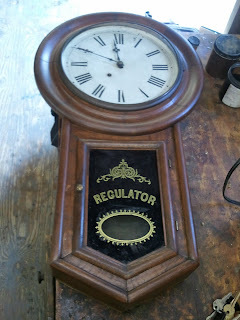 After the case was waxed, the entire clock was reassembled. 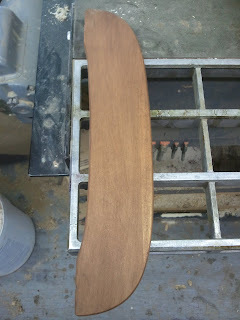 Below are two photos of the clock during the application of the new finish. 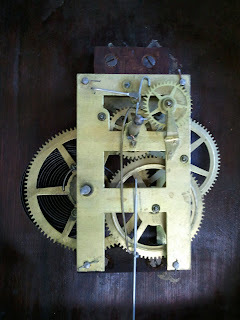 These are followed by several photos of the clock after it was completed. 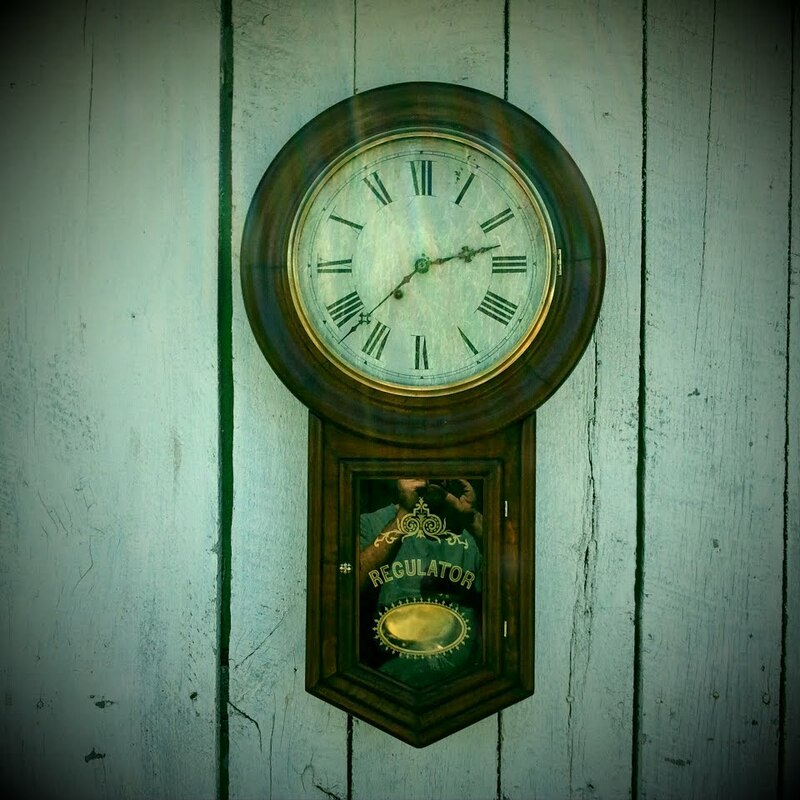 The last three photos were taken using the Retrocamera setting on my phone and seemed to be very appropriate for the clock. 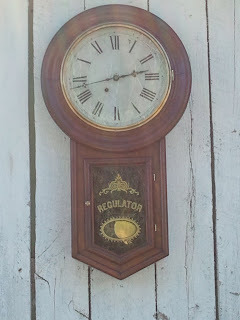 As for the clock itself, I started the pendulum when I was finished and it seems to keep pretty good time! 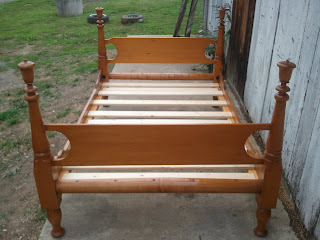 Most of the photos below are of the bed that I have been working on completed. 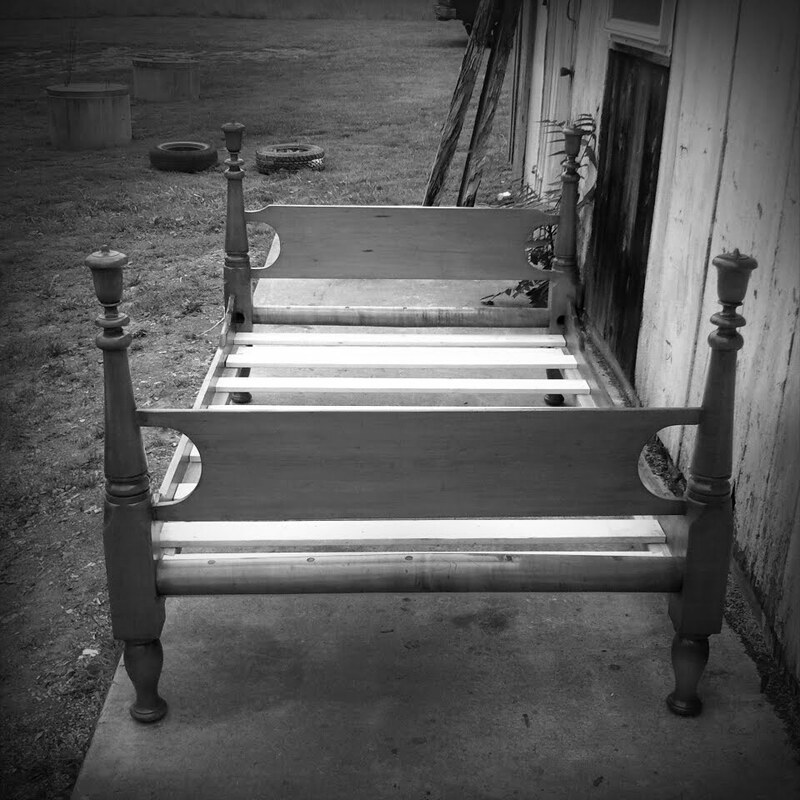 I also included several color and black and white photos of the bed taken with a RetroCamera App on my phone just for fun. Before getting into those, I also included a few photos of the slats that I made for the bed. 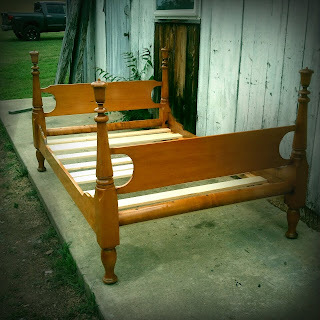 The bed had a unique problem in that the hardware that connected the rails to the head and foot board is a hook assembly. This is common enough, but usually, the hooks, which are connected to the rails, have two hooks per end. 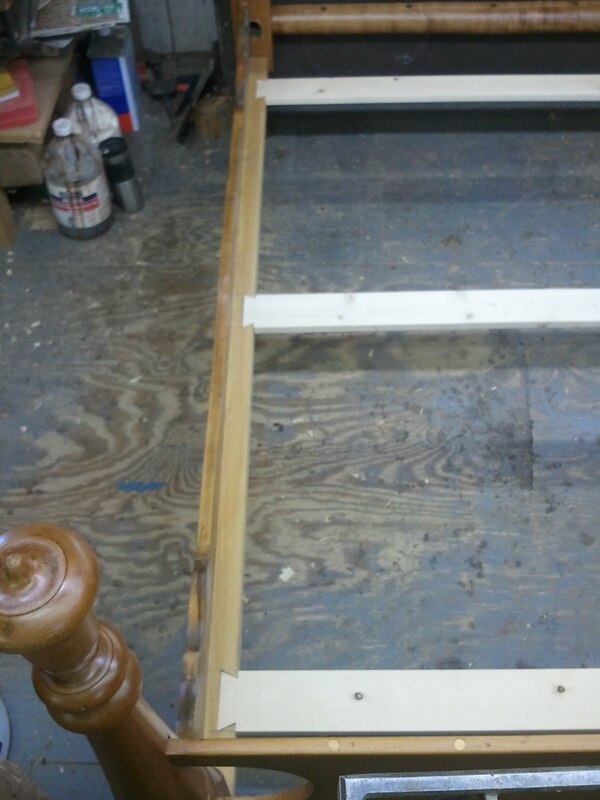 the reason for this is to keep the rails from swinging side to side. This bed had one hook per end, and so the rails moved around. 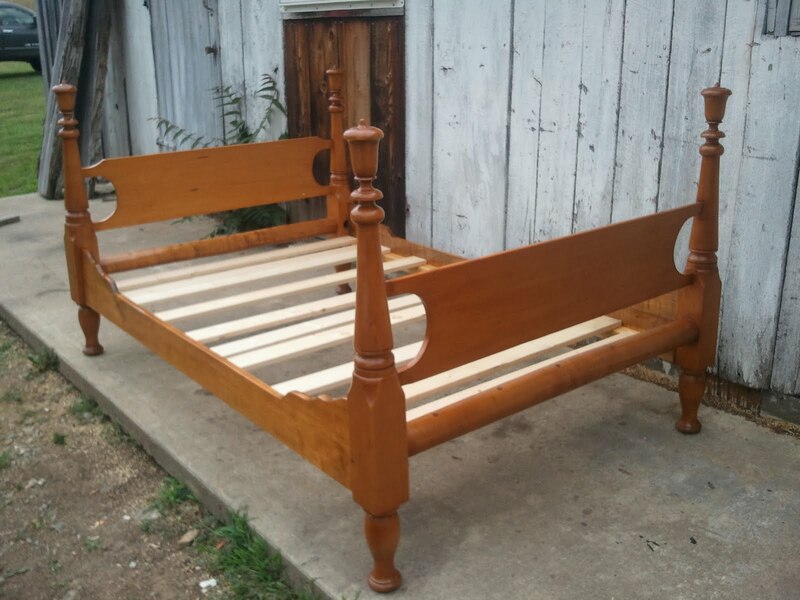 The worst case scenario would be one of the rails slipping out from under the mattress and the mattress and the occupant falling to the floor in the middle of the night! To rectify this, I kept the existing hardware, but made three special dovetailed slats that fit into the rails and prevent any movement. These slats lie underneath the other, more conventional slats. 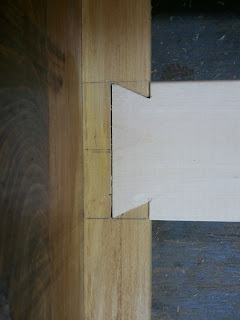 Here is a photo of the slats followed by a close up of one of the dovetails. 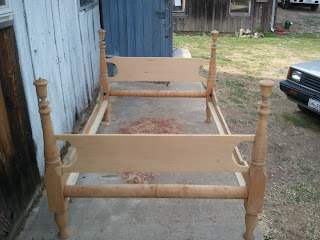 The rest of the photos below are of the completed bed. The first three were taken with a regular camera setting and the rest with the RetroCamera setting. 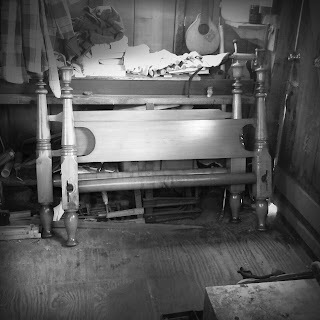 One of the pieces I am currently working on is a 3/4 size bed made of Maple that dates to around 1840. The only exception to the Maple is the Pine head and foot boards. 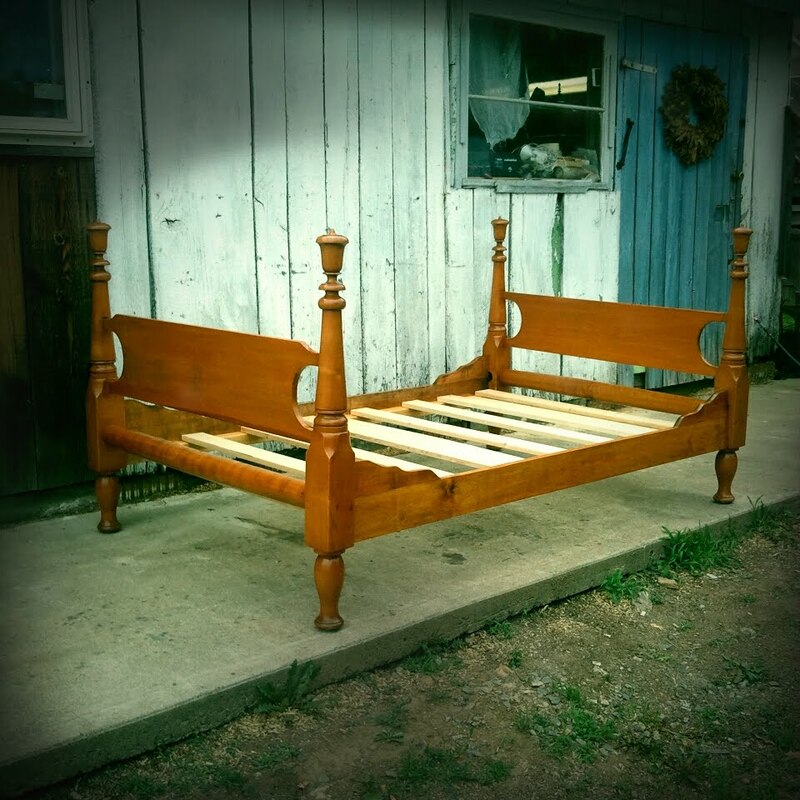 This bed is what is called a sacking bottom bed and is often mistaken for a rope bed. The difference is that in a rope bed, the rails would be pierced and the rope would thread through the posts, making up a web that the mattress could sit on. 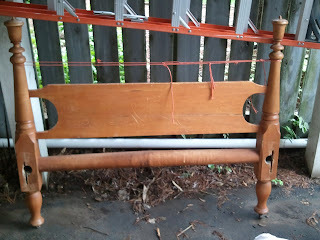 The sacking bottom bed has a canvas with grommets, similar to a modern tarp, that is stretched and tied with ropes. 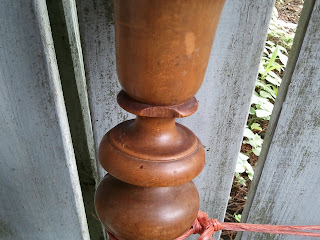 The rails have pegs which protrude for the rope to wrap around. 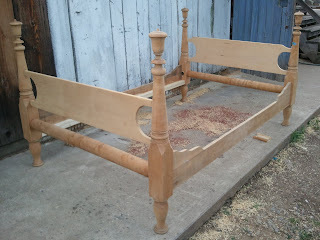 One of the things that I find interesting about this bed is its construction. The side rails and the rails below the head and foot board were turned. At each end of a rail, the rails were threaded so that they screw into the posts. 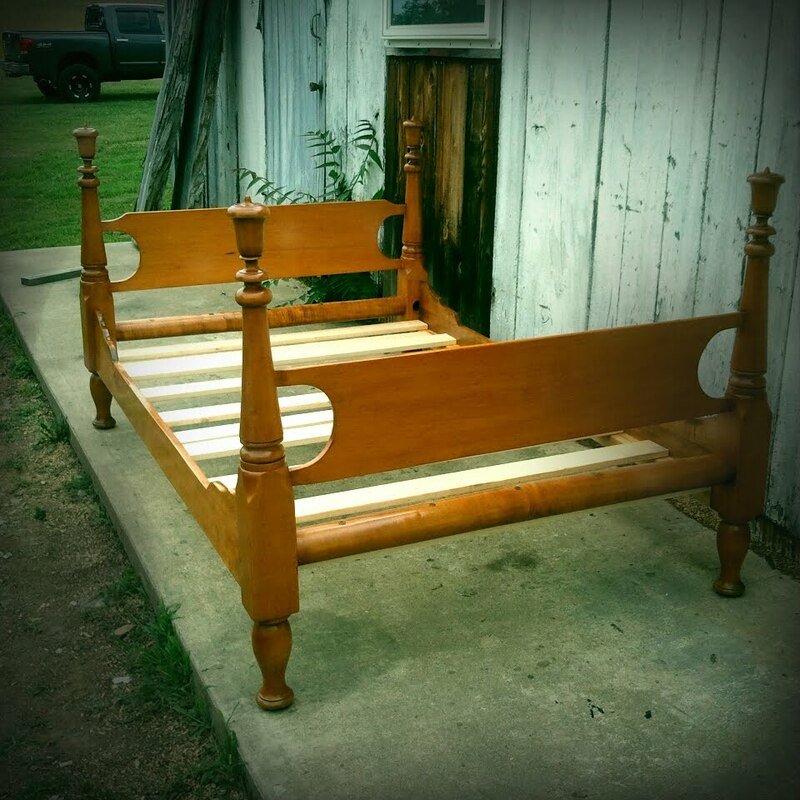 What this means is that the bed can be completely dismantled for storage. 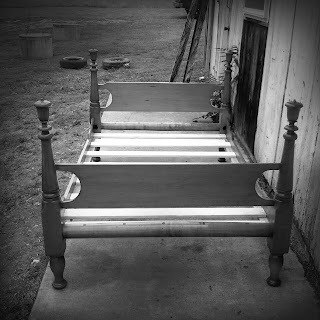 The flip side of this is that it takes three people to put this bed together! 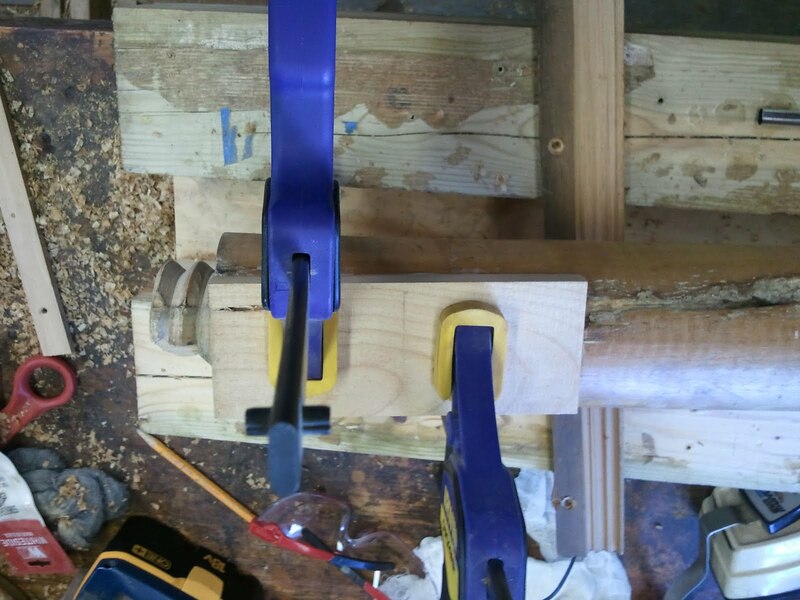 One to hold each post, and a third person to screw the rails in place. 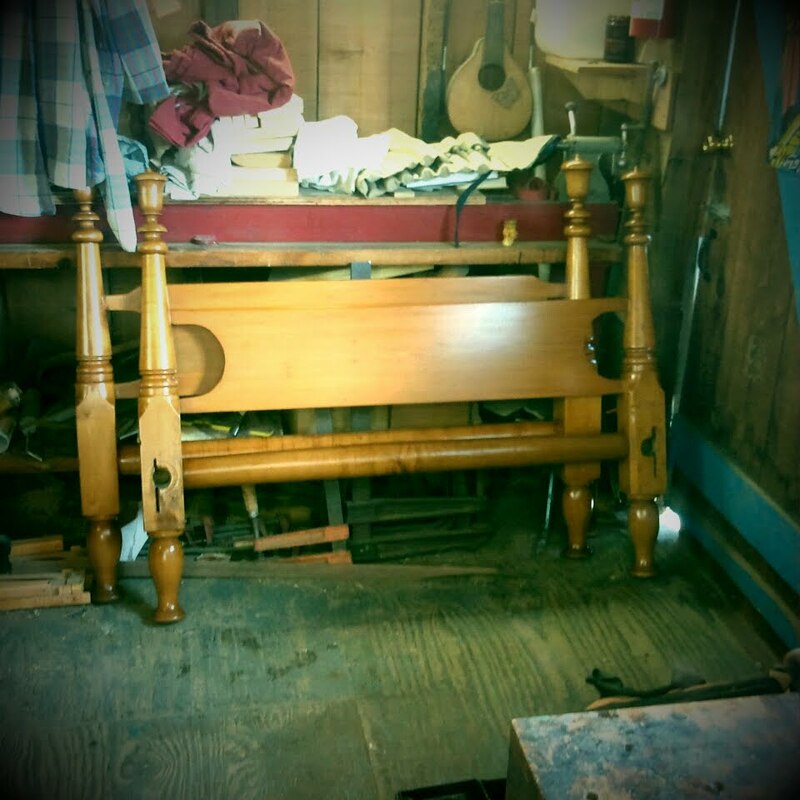 The result is that the bed is very tight when assembled, and the original sacking bottom would have pulled the rails so that they got even tighter, eliminating a squeaky,loose bed (a rarity in antique beds). As time went on and people switched over to a box spring, these beds were converted, and this is the case with this particular bed. 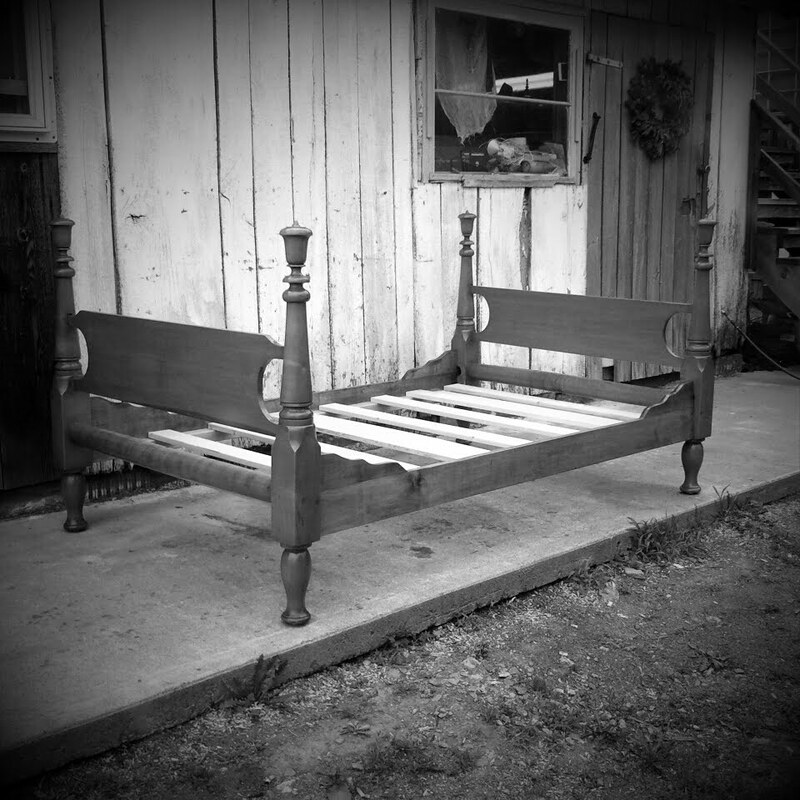 The original rails for the bed were discarded and new more traditional rails retrofitted , probably some time in the late 19th century. The bed was in decent shape when I got it, but needed some structural repairs which meant removing the finish. Below are a series of photos that show the repair work in progress. 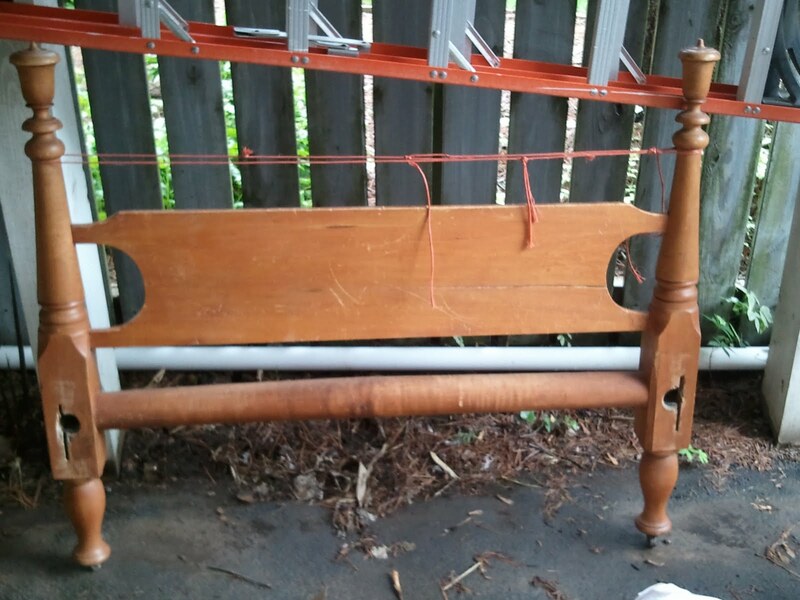 Here are two photos of the head and foot board. You can see the holes in the posts where the original rails would have threaded in. 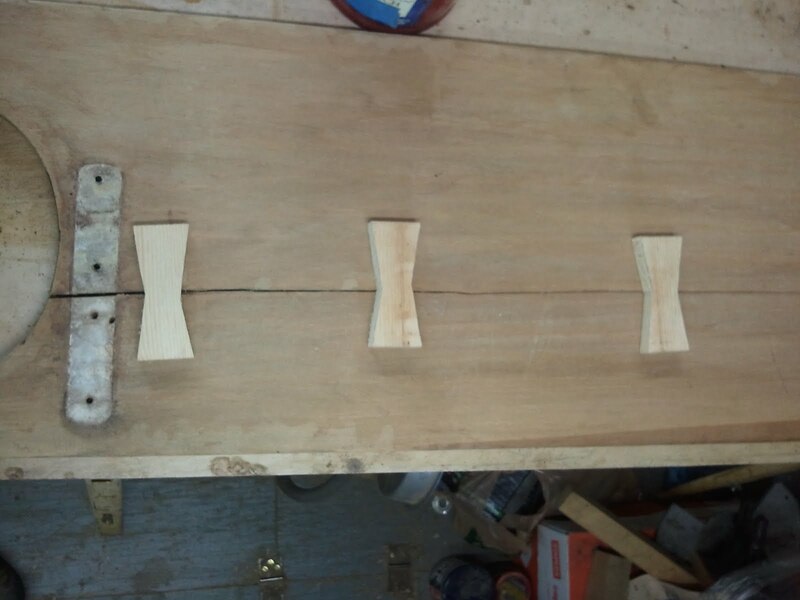 The long vertical mortises next to the holes accommodate the hardware for the replacement rails. On the rails, there were boards added to the top at either end for decoration. 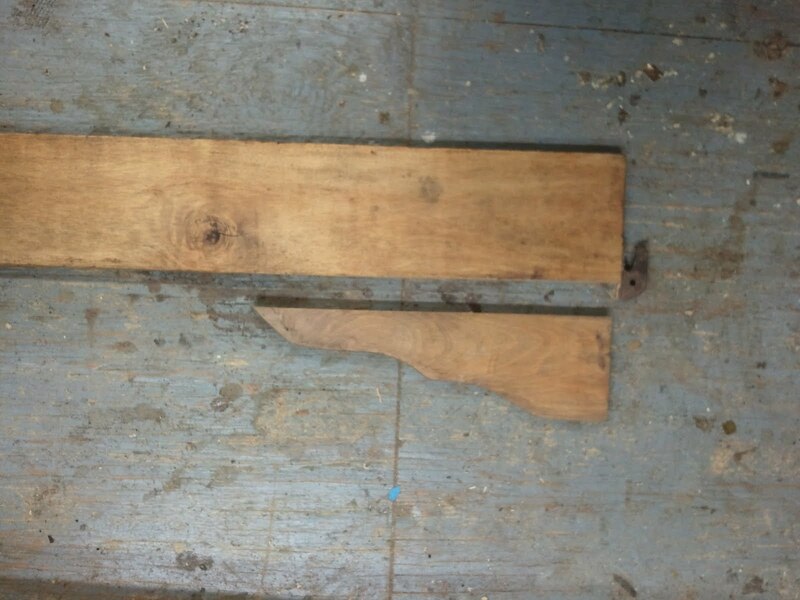 One of these boards was very loose and had fallen off. 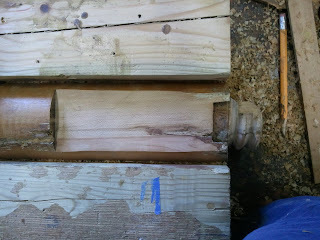 Below is a photo of the boards followed by a photo of the repair. 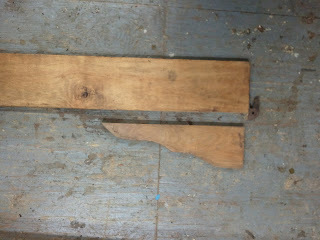 Both the head and the foot board had cracks in them which came from shrinkage in the wood. 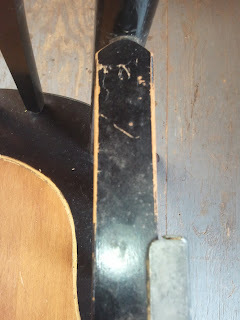 Luckily the crack in the foot board was not to severe, and I was able to draw it together with screws that were hidden, minimizing the visual impact of the repair. 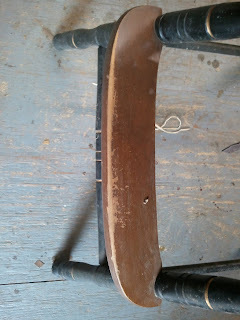 The head board had a more significant crack that had been previously fixed with an iron mending plate. The plate was removed and three butterfly patches were inlayed into the back side of the head board. 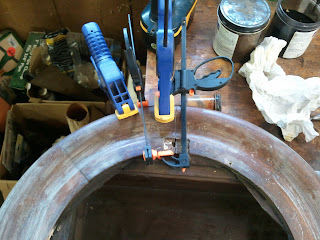 Below are some photos of this process. The patches will later be touched up. 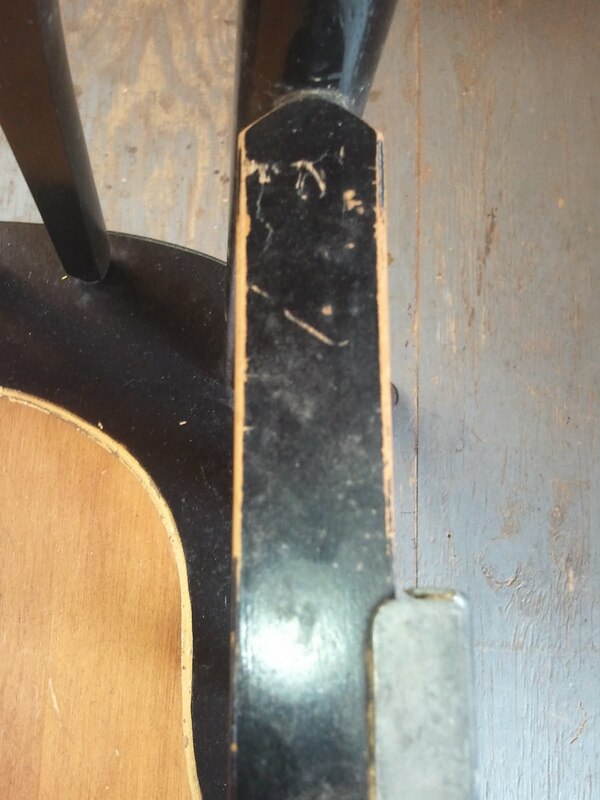 The crack in the head board and the mending plate. The three butterfly patches laid out. 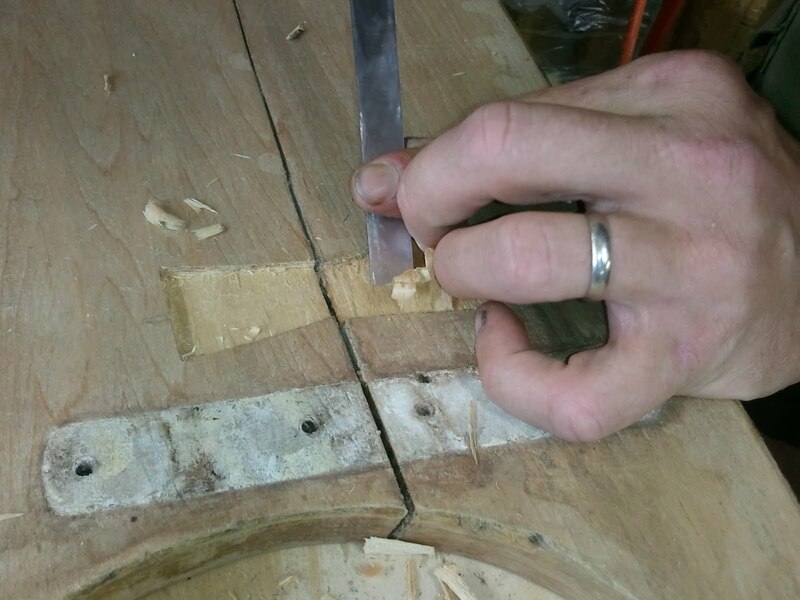 Carving out the mortises for the dovetails. 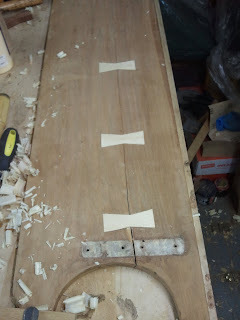 The three butterfly patches in place. 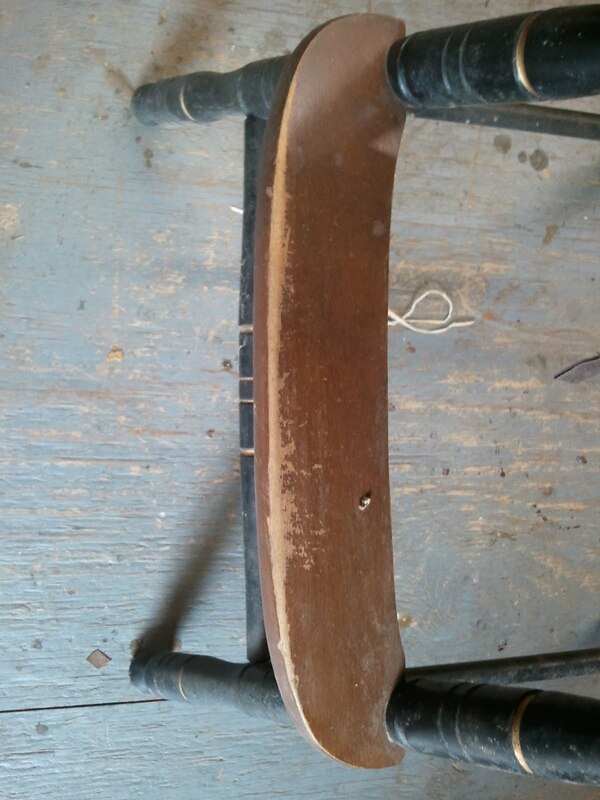 The crack was later wedged with wood on both sides. 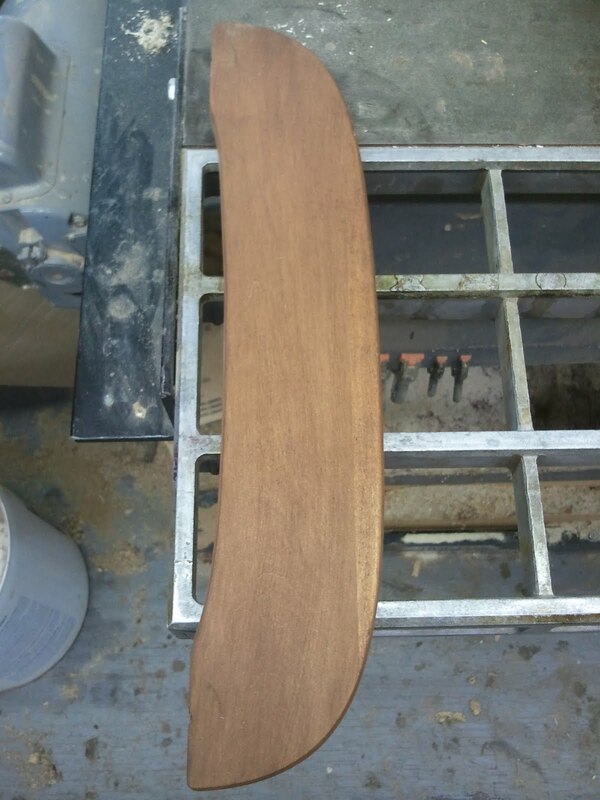 The rails for the head and foot board were turned out of solid maple. Finding turning blanks that were this large in diameter has always been a problem. As a result when the bed was made, the cabinet maker used a piece with a little bit of bark inclusion. 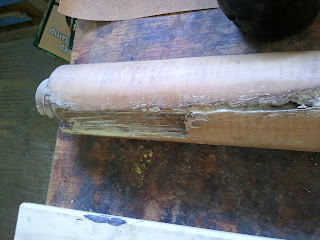 The bark was situated so that it was on the underside and not visible. 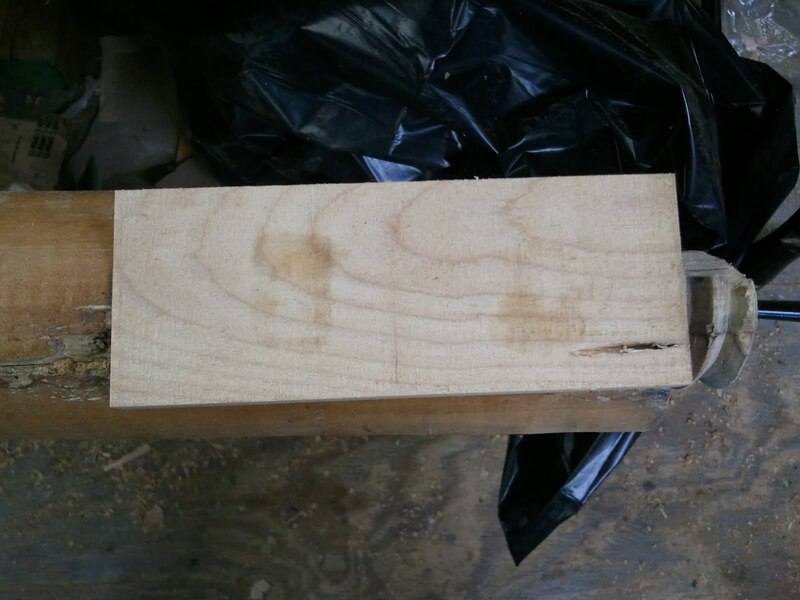 Over time this bark has fallen out a bit and at the end a significant portion of the wood and bark was torn off. 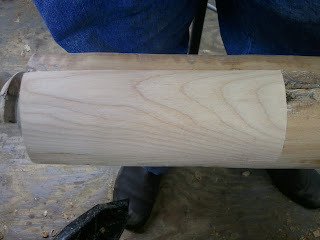 I decided to patch the missing portion of the wood and fill the bark areas. 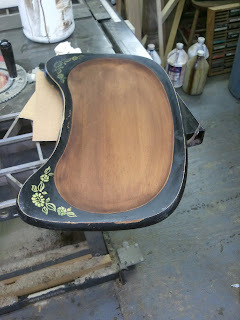 They will eventually be fauxed to look like bark again. Below is a photo of the damaged area. 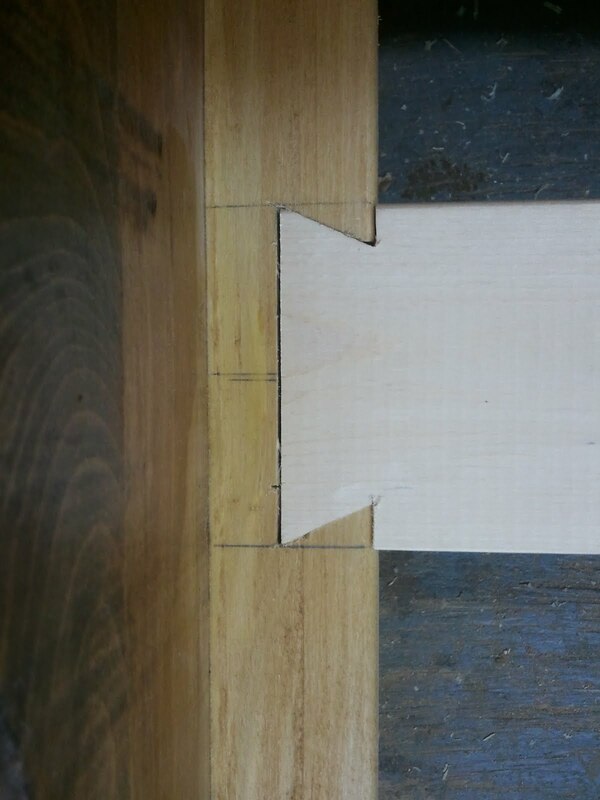 Using a router and a special jig I made, I was able to create a flat spot for a patch to fit into. In this photo, the patch is being glued in place. 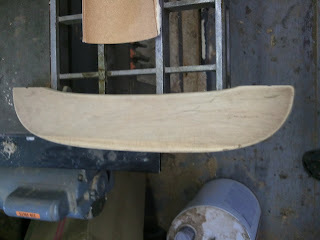 Here is the patch, ready for carving. 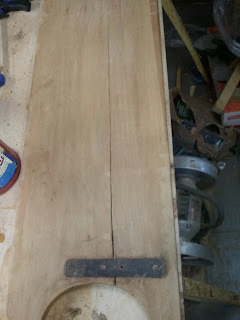 To round over the patch, I used a hand plane to remove the majority of the material, followed by some chisel work and some final sanding. Here is the patch after it was carved. 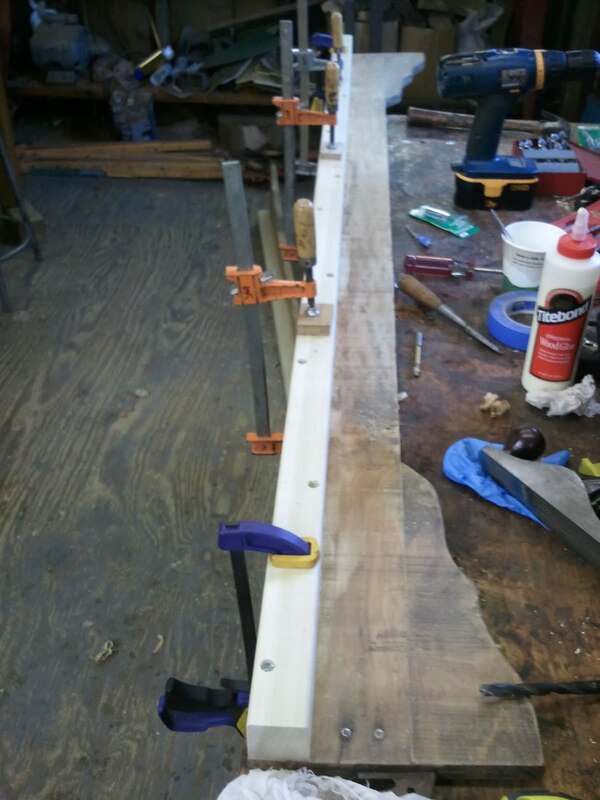 One of the rails was bowed pretty badly and to remedy this, I replaced the slat supports with new straight and sturdy supports. There is still a little waviness to the wood, but it reduced the bow to 1/8 of an inch across the entire length of the rail. 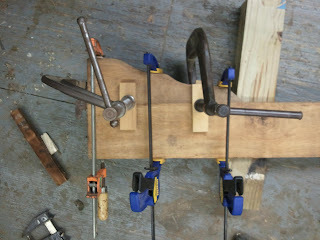 Here is a photo of the new slat supports being glued in place. There was a little damage to the turning on the bed. The photo below shows that there is finish on the broken area of the turning. 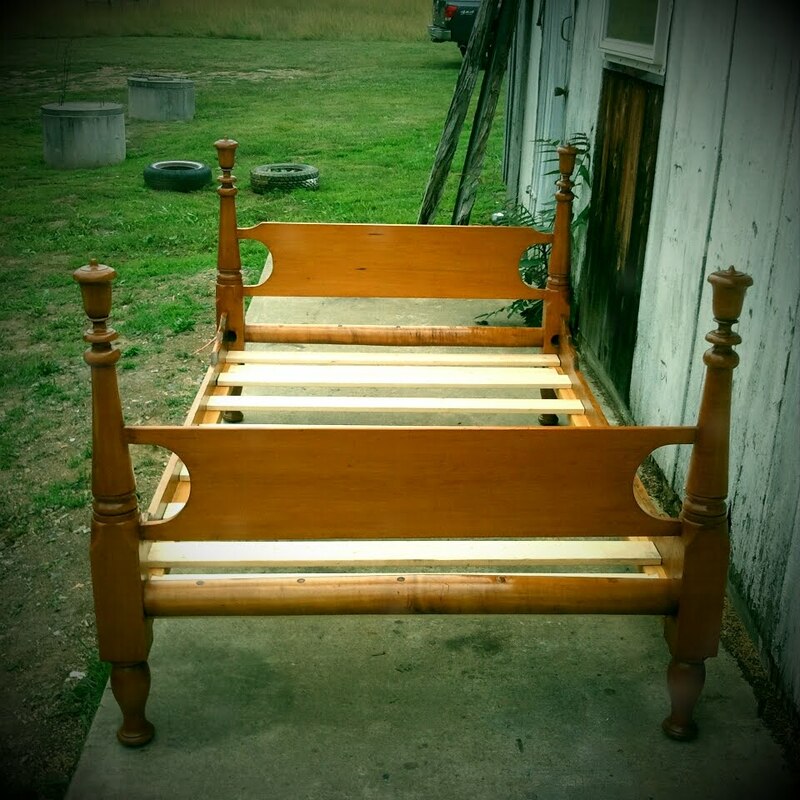 This and other indicators led me to believe that this bed had been refinished in the past, and helped me to make a decision about removing the existing finish. 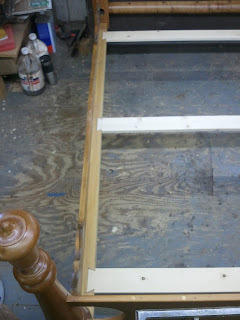 Below are a few photos of the patching of this broken area. 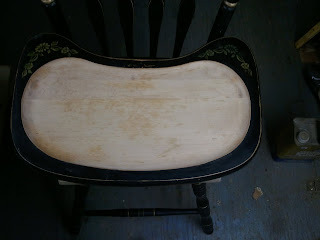 The initial patch glued in place. The patch after it was carved down. 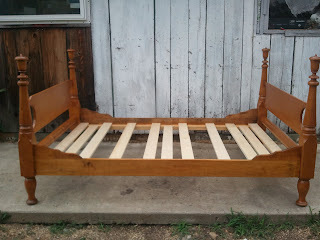 These last two photos show the bed after the repairs were made and the pieces sanded. 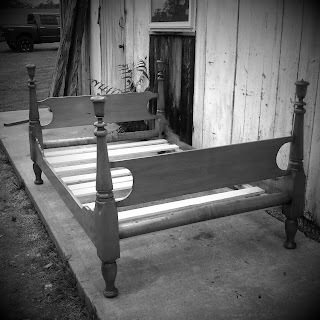 In my next post I will show the fabrication of the new slats and also the completion of the bed. 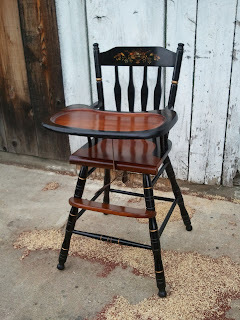 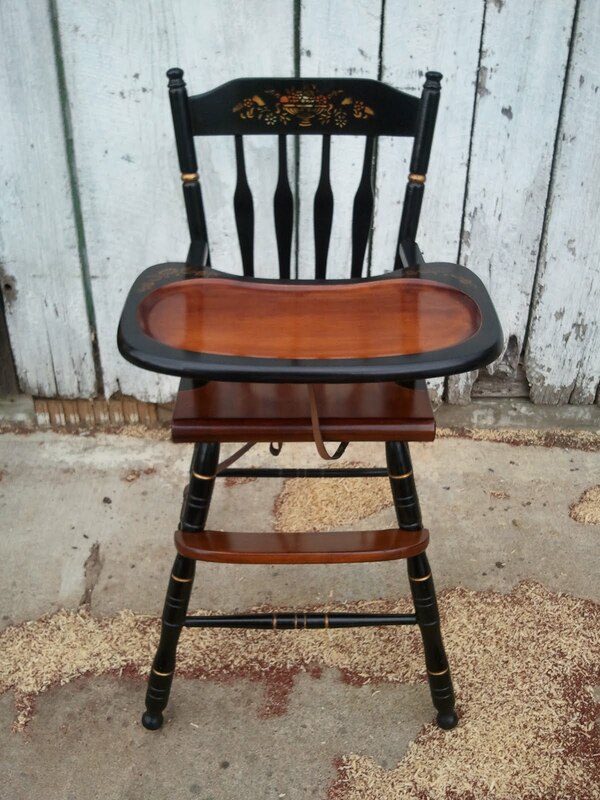 Another piece I have recently restored is a Hitchcock style high chair. 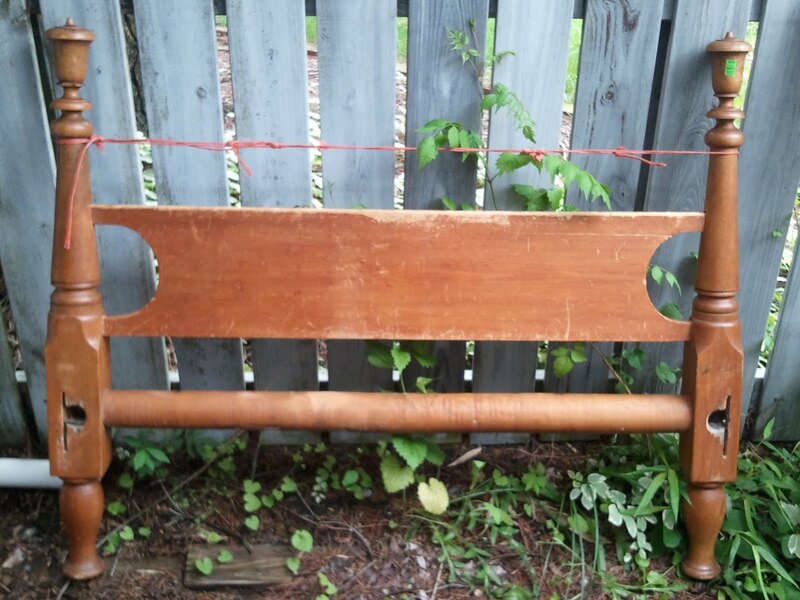 I figure it was made around 1970, but it could be older or younger. 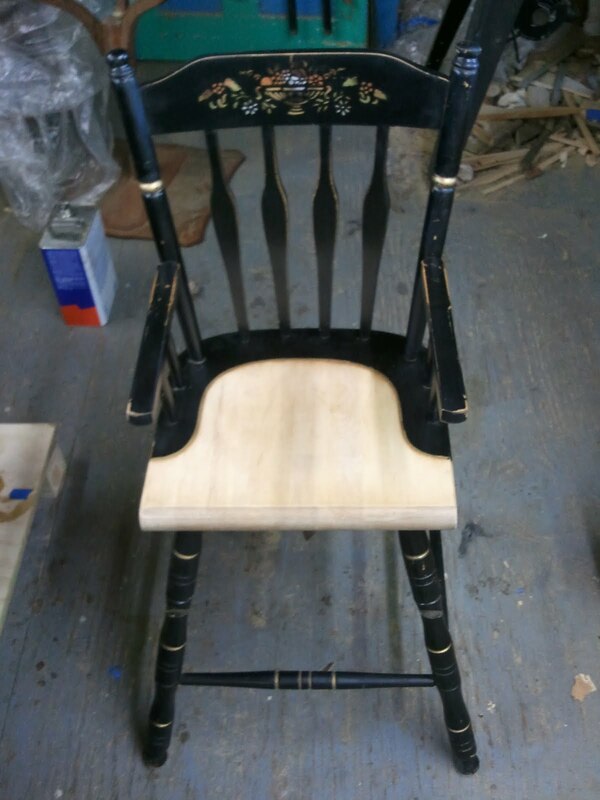 The chair was in pretty good shape, except that the finish had deteriorated. 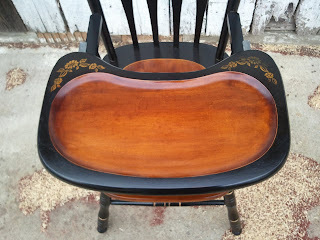 The black painted areas and the stenciling were in good enough condition to restore, so I selectively masked off the wood areas and removed the finish from these sections only. I then sanded and stained those areas and applied shellac to those areas. After the finish was built up a little, I started to coat the entire chair. 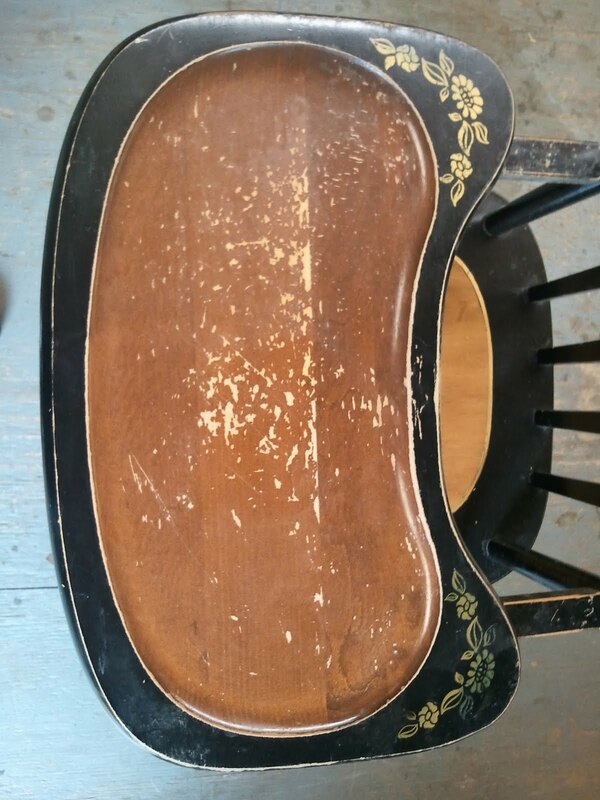 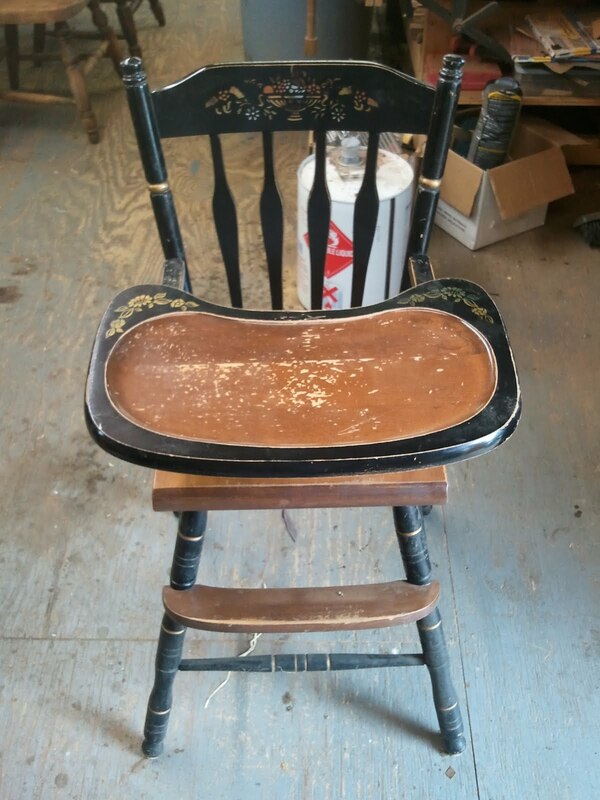 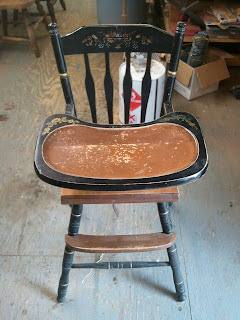 The worn areas on the black surfaces were touched up and the chair was eventually waxed. 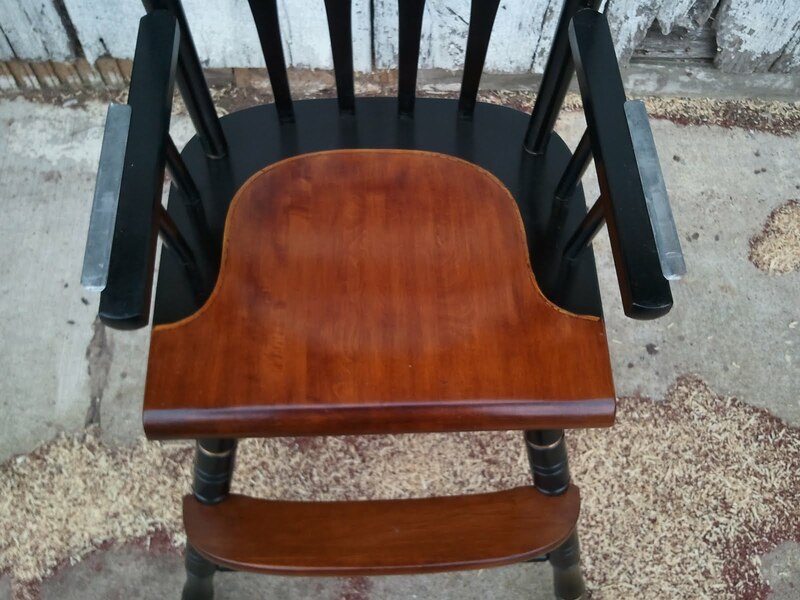 The beauty of using a shellac finish on this piece is that it is a child friendly finish and now the high chair is ready to use! Below are photos of the entire restoration process. Here are a few photos of the chair as it came to me. 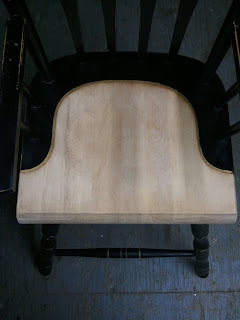 The next few photos show the chair after the natural wood areas has been stripped and sanded. 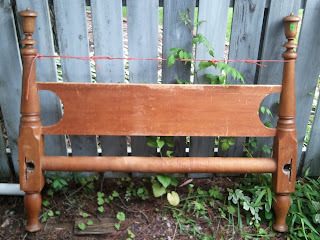 These next few photos show the same sections after they were stained. These last few photos show the finished product.